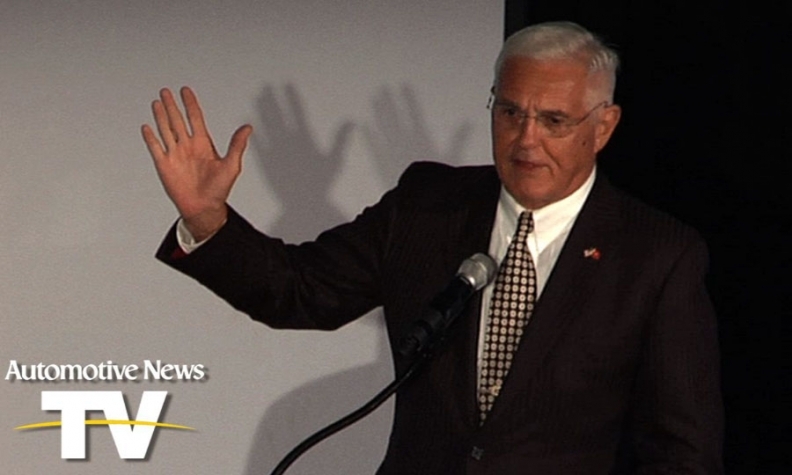 DETROIT – Former General Motors product chief Bob Lutz yesterday contrasted his attempts to create an "excellence pays" culture at two of his employers. Following his 1998 departure from Chrysler, the company reverted to old practices that left it in the "porcelain bowl," Lutz said in his induction speech to the Automotive Hall of Fame. In contrast, Lutz said, a culture of excellence has become deeply ingrained at GM. A string of recent honors, including the Chevrolet Impala's top-sedan rating this week from Consumers Reports, reflect that, he said. His conclusion: "Product excellence is the final driver of market and financial success." Lutz, 81, spent most of his GM career as vice chairman in charge of product development. He retired from GM in 2010. He also worked at BMW AG and at Ford Motor Co.
David Cole, chairman of emeritus of the Center for Automotive Research. Jackie Stewart, former Formula One driver and three time World Champion. Robert Bamford and Lionel Martin, founders of Bamford & Martin Ltd., which later became Aston Martin. Bo Andersson, former GM purchasing chief who is now CEO of Russia's GAZ Group. Neil De Koker, retiring CEO and founder of the Original Equipment Suppliers Association. James McElya, who returned to Cooper-Standard from retirement and led the supplier through a successful restructuring. Lapo Elkann, president and founder of Italia Independent Group and Majority shareholder of Exor, the Fiat Group holding company.